For many, the Himalaya are synonymous with Nepal, but let’s not forget the other countries that these majestic mountains extend into – there’s so much variety and wonder in the region, just waiting to be explored. Holidays to Burma's northernmost areas are a chance to trek through the pristine jungle lowlands and dazzling mountain vistas of the Himalayas’ easternmost foothills, stopping at golden temples and tranquil villages along the way. Here are some of the sights you’ll see – do remember to take your camera and some extra memory cards! Most treks start in Putao, a remote mountain town where spending a few hours strolling around helps ease you into the pace of mountain life – be sure to visit the lively local market. 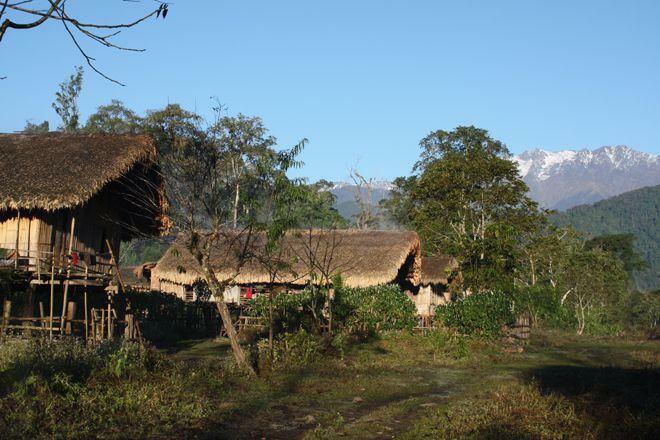 As you head out to trek through the lush lowlands, you’ll pass the fields and homes of Rawan and Lisu villages, perhaps stopping to meet the people and learn a little about their culture. If you want to take photos, be sure to ask first – remember that you’re a guest in someone else’s community. If you’re lucky enough to be passing through during a festival, you may be able to see colourful dances and important rituals. Away from human habitation, keep an eye out for interesting flora and fauna – as one of the largest continuous forests in Southeast Asia, the forest complex of the Burmese Himalaya is known for its rich biodiversity and high proportion of endemic species. You’ll see an incredible range of trees and flowers, as well as birds, reptiles, amphibians and maybe some monkeys. Your guide may even be able to find some boar, elephant or tiger tracks to point out. And finally, the star of trekking holidays in Burma – Phongun Razi, whose snow-capped peak stands at 3,634 metres above sea level. It is a fine sight and offers astonishing views of the Himalaya, stretching deep into India.